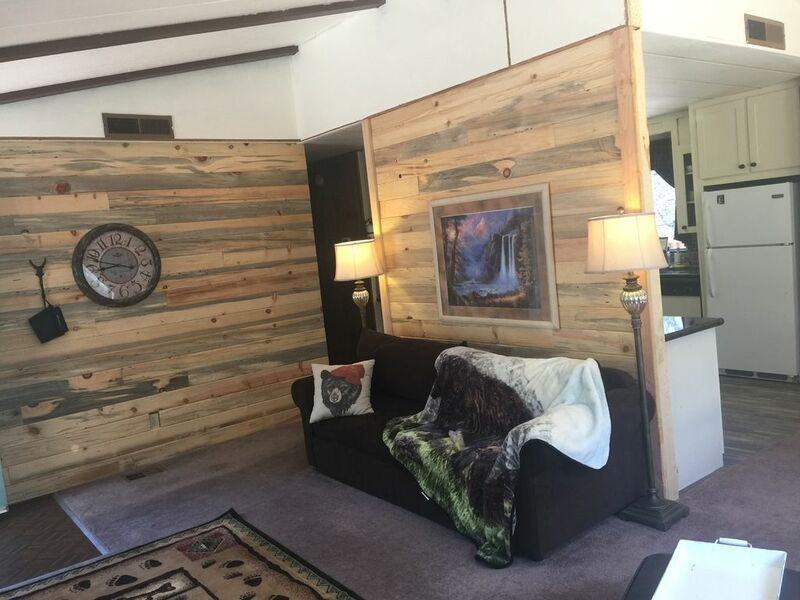 Cozy Bear Hollow " Cozy, rustic charming, a great value"
Ken and Victoria, have dreamed about owning a vacation rental for many years. This is an answer to prayer. We love the location; Close to town; surrounded by mountains; Private, nestled in the trees. If you're looking for a five star hotel, Cozy Bear Hollow is probably not for you. But if you're looking or a cozy, private, woodsy 2 bedroom place, out of town, yet just minutes from town, for less than the cost of a local hotel room... If you enjoy sitting in a hot tub, surrounded by trees, or BBQ ing on a private deck. ....You may really enjoy Cozy Bear Hollow. Both bathrooms have a shower/ tub, toilet, and sink. Grace Oaks Property, which has Grace Oaks, and Grace Oaks Cozy Bear Hollow sits on a lovely oak covered 8 acre parcel. Just out the back door, you can see part of the lovely mountains that surround Mariposa. What a perfect little hideaway for those traveling to Yosemite. The home is perfectly decorated and so warm and welcoming. Everything was lovely! Thank you for a wonderful stay! Rooms and bathrooms were spacious and clean. Living room was large and comfortable. The kitchen was not only big, but had every utensil, bowl and cooking implement that we could imagine. We loved sitting on the deck and the hot tub was relaxing. We were delighted with our stay and plan to return. We have already referred other family members and friends. Victoria responded quickly with directions and tips to get to the place. She was also super helpful to assist with extending our stay when I entered the dates wrong. We were so pleased with our stay and the accommodations at Cozy Bear Hollow. It was private and had everything we needed to relax after day hikes in Yosemite (which was pretty close!). Everyone slept comfortably. Such a pleasant experience with cozy touches everywhere. I would recommend Cozy Bear Hollow to anyone looking to come out this way! House is comfy little problem with heater may have been operator error. Directions were great and it was a nice environment would stay again. An extremely well-equipped place with a very warm and comfortable feel. Located well to access Yosemite National Park. Mariposa is called the gateway to Yosemite.